ArtServe seeks live painters to dazzle the crowd at the W’s Living Room Lounge for a night of creativity and fun. This is a paid opportunity for the Featured Artist. An opportunity to expose your work to the local art scene and guests visiting South Florida. Other artists will be welcomed to participate as Guest Artists, but will not be paid. Artist are to bring their materials, tools, and medium to the painting site. The W will provide a 48 x 60 canvas, easel, and drop cloth. Artist should be set up by 8pm to begin work. With some prior planning, we may accommodate some preliminary work to be done to the canvas. 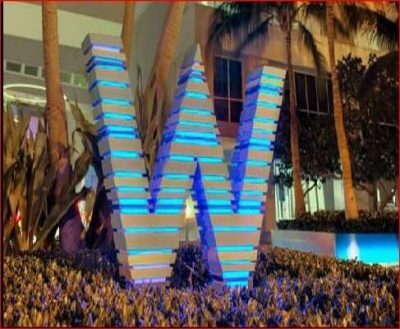 The W will add the work(s) to its Studio collection, for possible future sale.